Pamper yourself with these amazing Spa Offers, available for a limited time only! 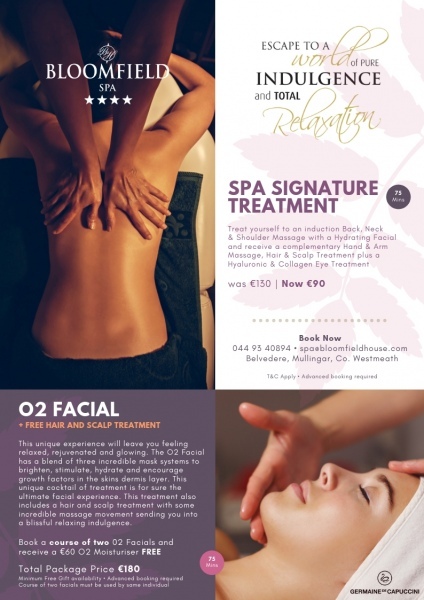 Indulge yourself at Bloomfield Spa, Mullingar. 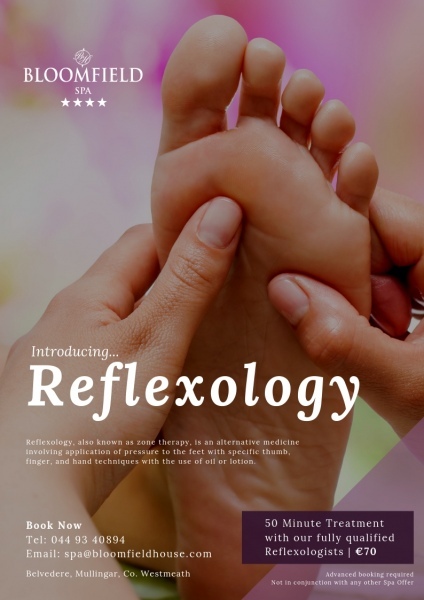 A wide range of pampering treatments and beauty treatments await. All our Facial, Body and Signature Spa Treatments and Packages include full use of our Sauna, Steamroom, Jacuzzi, Swimming Pool and Relaxation Room. Afterwards, take a lake stroll, dip your toes in the lake from our jetty or sit back and enjoy the stunning views of Lough Ennell to totally relax and unwind. Our team of experienced and certified spa therapists will be happy to prescribe a treatment package designed specifically for your needs and can offer the best advice for your skin’s requirements. To avoid disappointment, advance booking is required. Check out our Spa Brochure, Ultimate Spa Package and Overnight Spa Breaks below to see what takes your fancy.